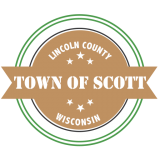 Formed in 1881, the Town of Scott is located in Southern Lincoln County, Wisconsin. Our population is just over 1,400. The town is comprised of 17,469 acres; 8,082 of which are classified as agricultural, 1,543 residentials, and 288 commercial. The remaining 7,556 acres are a mix of undeveloped land, forest land, and agricultural forest land.